Come join us for a morning introduction to our community lifestyle! 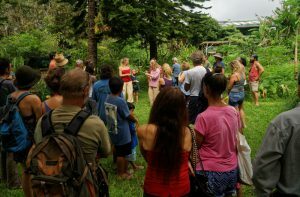 We are a committed group of people working together closely in community, on our 24 acres organic permaculture farm. We integrate the social aspects of sustainability into daily life: how to live together with honesty, love and peace, and share power and leadership. We do not have one central leader, but instead share the cost of the land and the leadership equally. This is a great time to come tour our land, ask questions about community and get a peek into our daily life. Take a fun and informative tour of our land, including our organic gardens, alternative building methods, animals and orchards. Aniko loves nature, she is passionate for the ocean and a surfer. Aniko is a certified yoga instructor, has studied and taught Non Violent Communication, and Peer Counseling. donation, suggested $5-15 if you can. No one turned away. Let us know if you are coming. Thanks!